by Nelson Searcy, Kerrick Thomas. Baker Books, 2017. In 2010 more new congregations began than closed. Studies shows that trend is continuing into and perhaps past mid-decade. Are you considering starting a new congregation? The book Launch might help. 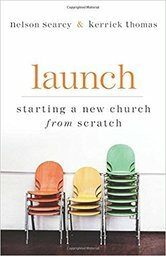 The two authors share lessons learned starting the Journey Church of New York City. The narrative captures many personal stories. There are others resources for demographic data. However, this book tells the Journey Church story well. What you gain is the wisdom of companions; the acumen of two who have started a church from nothing and done it admirably. The book deals with spiritual dynamics (celebrate baptisms with joy) and with operational subtleties (don’t underestimate the need for excellent record keeping). If you need facts and figures of national efforts regarding church planting you will want to look elsewhere. If you are looking to learn from another’s story, this book will let you know that you aren’t laboring alone.